The public is invited to make suggestions on what should be done with a community space at the long-awaited new surgery in Brownsover. A consultation was launched today (Thursday, April 20) to find out what people think the space joined to the proposed GP surgery in Bow Fell could be used for. Residents can submit suggestions online or visit an event to find out more about the plans at Brownsover’s Christ Church hall, in Hellvellyn Way, from 2-8pm on Wednesday (April 26). The surgery is scheduled to open next year after numerous delays and has been a long time coming for people in Brownsover after it closed two years ago. NHS England’s business case for approved in November and a planning application for the surgery is expected soon after a consultation event on March 2. 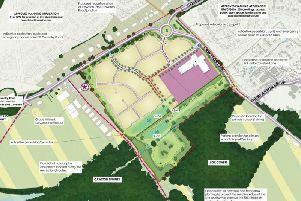 NHS England intends to hand the freehold of the space to Rugby Borough Council, and the council wants to hear the community’s views on the facilities which should be on offer when it opens. To take part in the consultation online, which has no end date at the moment, visit www.rugby.gov.uk/bowfell.